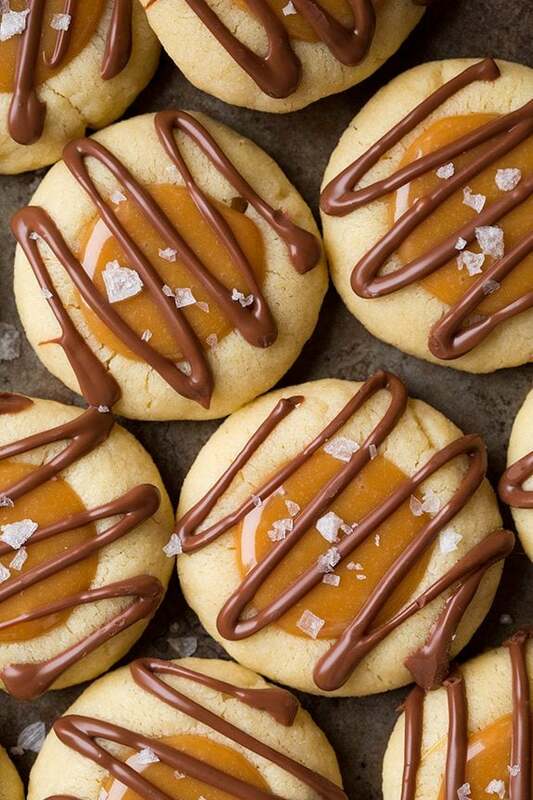 A buttery tender thumbprint cookie, filled with an easy, sweet caramel filling and finished with a milk chocolate drizzle and flaked sea salt. These cookies taste like Twix but better, so in other words they’re an absolute dream! 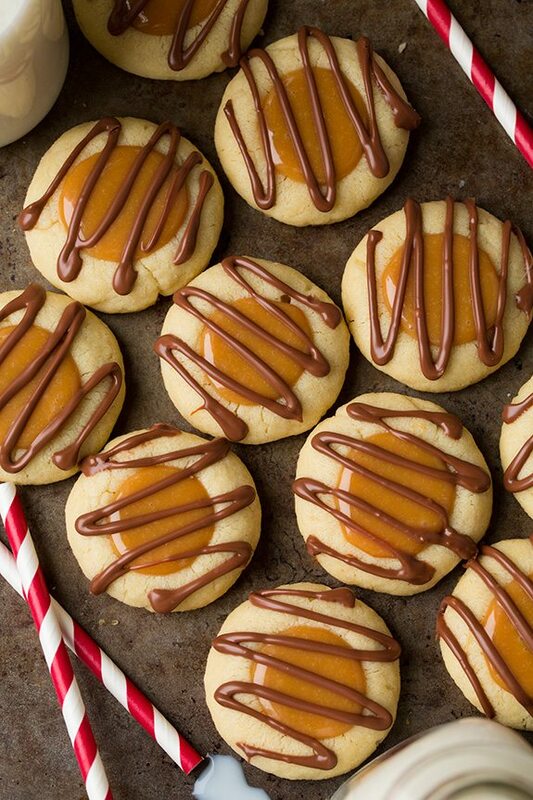 Thumbprint Cookies with the Classic Twix Candy Bar Flavors! 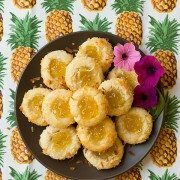 It’s getting to be that time of year, where there seems to be an endless supply of cookies coming from every direction – or maybe that’s just me because I make ridiculous amounts of cookies during the holidays! But no one is complaining around here. I’ve made a chocolate version of these cookies but I wanted to go with a traditional vanilla version – and they will remind you so much of a Twix candy bar! What’s not to love here? 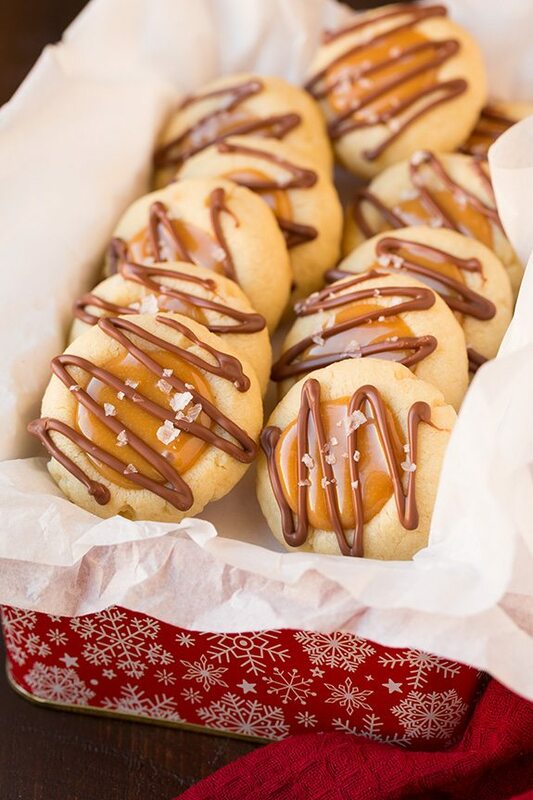 Melt in your mouth shortbread style cookie, chewy caramel center with a hint of sea salt, and a finishing touch of luscious chocolate, they are simply dreamy! Be sure to try them at least once during the holidays, you won’t regret it! Roll dough into balls and make indentation. Chill. 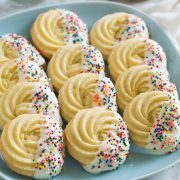 Re-indent cookies and let cool. 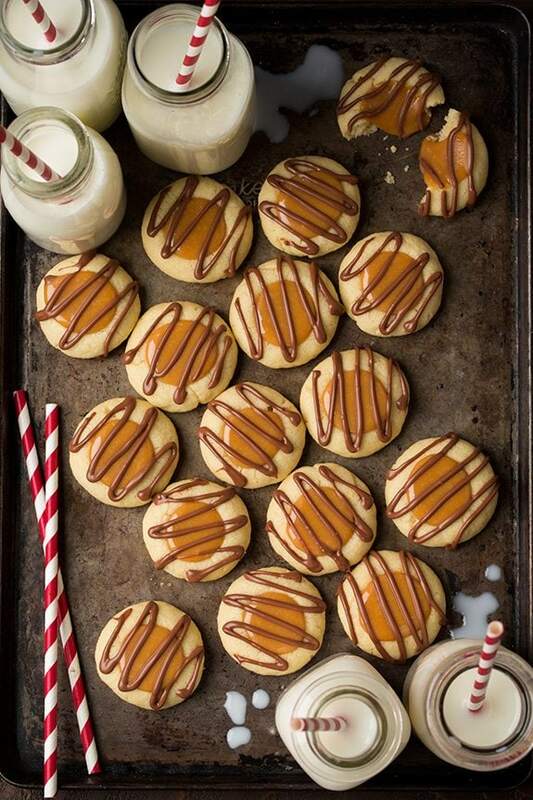 Melt caramel with cream and fill centers of cookies. Drizzle with melted chocolate, sprinkle with sea salt. Let chocolate set. If you want to take it one step further you can double the amount of chocolate and instead of using chocolate chips use good quality chopped chocolate, temper it and dip the bottoms of the cookies before you drizzle the tops! It’s what I would have liked to do with these but I just didn’t have enough time. No matter though, they were still totally decadent and delicious! And yes of course you don’t find gourmet flakes of Maldon sea salt on top of a Twix – but they should totally start adding it, don’t you think? I added it and it gave them that totally irresistible salted caramel flavor we all crave. Total Twix upgrade! I’ve always loved those candy bars so these cookies have my name all over them and they’ll likely become a holiday tradition for me. 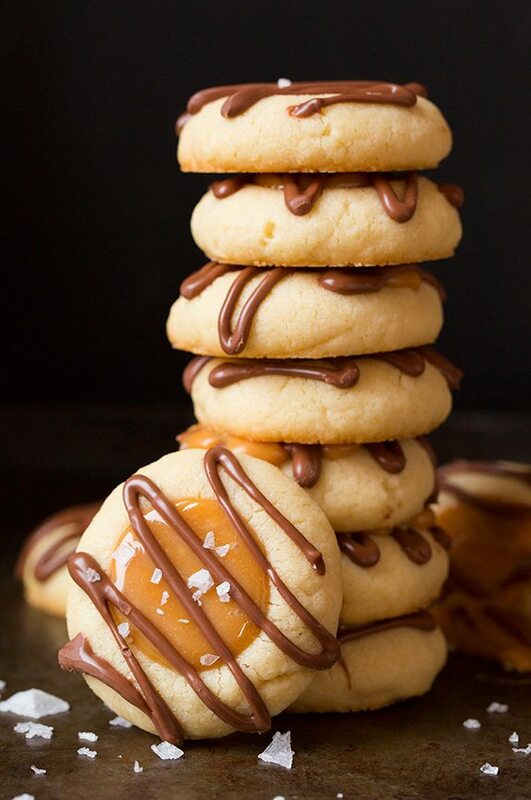 A buttery tender thumbprint cookie, filled with an easy, sweet caramel filling and finished with a milk chocolate drizzle and flaked sea salt. These cookies taste like Twix but better, so in other words they're an absolute dream! For the cookies: In a mixing bowl whisk together flour and salt. In the bowl of an electric stand mixer fitted with the paddle attachment, cream together butter and sugar until well combined. Mix in egg yolks and vanilla extract then with mixer set on low speed, slowly add in flour mixture and mix just until combined. Scoop dough out 1 Tbsp at a time (24g) and shape into balls then place on a flat surface and make an indentation in middle of cookies with thumb. Transfer to plates (leaving a little space between cookies for even chilling. 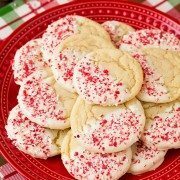 Also don't just make indentation when cookies are on plates or they'll likely stick) and chill in refrigerator 45 - 60 minutes. Preheat oven to 350 degrees halfway through chilling cookies. Transfer cookies to a baking sheet lined with a silicone liner or parchment paper, spacing cookies 2-inches apart (keep remaining shaped cookies chilled). Bake in preheated oven 14 - 15 minutes until set. Remove from oven and immediately use the back of a rounded teaspoon to make a deeper indentation in center (as it likely flattened out a bit while baking). Cool on baking sheet 5 minutes then transfer to a wire rack and cool completely. For the caramel filling: Add caramels and cream to a medium mixing bowl. Heat in microwave on 50% power in 30 second increments, stirring well between intervals, until melted and smooth. Spoon caramel into center of thumbprints adding just enough to fit without overflowing (about 1 heaping tsp). Rewarm as needed. For the chocolate drizzle: place chocolate chips in a microwave safe bowl and heat in microwave on 50% power in 30 second increments, stirring well between intervals, until melted and smooth. Pour melted chocolate chocolate into a small resealable bag or piping bag, cut a tiny tip from corner and drizzle over tops of cookies. Sprinkle with sea salt if using. Allow chocolate to set at room temperature or in refrigerator. Store in a single layer in an airtight container at room temperature. Butter should only indent slightly when touched. If it's too well softened cookies will spread more. Joanne Wagner: Delicious and beautiful! This recipe is definitely a keeper!